The case for rebirth has been elaborated from time to time by Theosophical writers, and it has been pointed out clearly that the teaching of Reincarnation is one which appeals to every thinking man and woman. Who of us that has ideals and a love for humanity does not welcome the prospect of returning to take up the work we love? And who of us supposes that it is possible to accomplish all that we would like to in the short span of one earth-life? And who can fail to note the response to the challenge of the times, when the world hungers as never before for the facts concerning life and death? This response is Theosophical teaching. In this article the effort will be made to elaborate the "How" of rebirth. By way of preface, we should point out that a clear understanding of the nature of the universe about us is imperative. The first step cannot be achieved until we recognise that the universe is a living organism — alive in every respect. For, were the universe a dead conglomeration of matter, it would be unable to support life anywhere, and we know that life is all about us on this earth at least. We must see all things as manifestations of life under varying conditions. We cannot see life, we see but its manifestations. This is only another way of saying that we live in a universe of phenomena, a universe of effects. It is impossible, however, to separate a cause from an effect, or vice versa, so that where we have a universe of effects (our visible, physical universe), there must be a universe of causes. This establishes a dual Cosmos, and eliminates at a stroke the old idea of a special creation. The idea of an extra-cosmic God is untenable. For if God is the cause of all that is, how can He be separated from the effects of his work? If we must hold to the idea of God, let us think of him as Cosmic Life, or the Universe of Causes. Man is a child of Nature, and as such, he must resemble his parent. And as the Universe is twofold in the sense that in one aspect it is a universe of cause, and in the other, a universe of effect, it follows that man in his turn is a being of cause and effect. This brings to mind the now well-known teaching of Karman, or the Law of Cause and Effect. When we say that each man is his own karman, we may interpret this in two manners. First as the twofold being just referred to, the outer phenomenal man of effects, and the inner man of causes, and secondly, in the sense that at any given moment a man is the sum-total, or the result, or the effect, of all that he has been in the past, and at the same time, he is the cause of all that he is destined to be in the future. Thus, he is his own cause and effect — his own karman. Now, there is a ceaseless interplay going on between the Causal and the Phenomenal universes, and it might be stated in a very crude way that life and death are merely the transfer of the man from one universe to the other. In life, the man is in the phenomenal universe, and in death, he has returned to the subjective universe of causes, only to reissue at some future time, and enter once more the arena of earth-life. But there is a great deal more to it than that. In the first place, we must set aside the idea that life and death are opposites. The opposite of death is birth, and both are gateways in Life, one leading into and the other out of our phenomenal universe. But Life is eternal and all permeant, and we must endeavor to understand just what entrance into a universe of Causes implies. To do so, we must consider the relation between the subjective and the objective in Nature. When we speak of things subjective, we are prone to consider them as being somewhat fanciful and unreal. If we hear of a man having had some horrible subjective experience, we are apt to pass it lightly by, and say, "Poor fellow, but it might have been much worse, and he will soon get over it," little realizing that an inner experience can change a whole life. Again, when we speak of subjective worlds, we think of them as worlds of fancy only, as though they were there in a sense, but quite unreal. When the facts are understood, we realize however, that the subjective, or causal universe is the real universe, without which there would be no physical universe at all. We can illustrate this best perhaps, by considering a book. What is a book? Is it the binding, or the type, or the pages, or even the words on the pages? These indeed make the volume, the object, but the real book is the subject matter of the volume, the message that is being given out. It may be in the form of information, or it may be a story, but whatever it is, the subject-matter of the book is the only justification for the book having been published at all. Without it the book would be a meaningless jumble of words. The real book consists of the ideas that are couched in words, and imbodied in the bound volume. So true is this that were all the books in the world destroyed, knowledge would live on, and there would always be the possibility for new books. Thus it is with this subjective universe. The causes arising out of the subjective universe are seen on the physical plane as our environment, and circumstances, and this physical world exists only because there is a continual outpouring of energy from the inner planes, resulting in outer phenomena. In like manner, man is a continual outpouring of energy from the inner reaches of his being. And this thought leads us to the main theme, the constitution of man as an integral part of the universe. In the first place, we know that we are much more than a mere body, a mere bundle of senses. We have minds, we have inspirations and aspirations, we have desires and emotions, and we will ignore at the outset the idea that these are the results of ferments going on in the brain cells. Let us rather reach upwards and inwards in thought toward a true understanding of ourselves, commencing with the body — only because it is the most obvious part of our makeup. One of the first things that comes to our notice when we study physiology is that there is a marked resemblance between all human bodies, not only in respect to general characteristics, but even in particulars, so that a surgeon, finding a certain bone or muscle in one human body, knows that he will find a corresponding bone or muscle in every human body. This suggests at once that the body is built around a certain pattern or plan, to which all human bodies conform. This pattern is called by the Theosophist the astral body, or double, and is in itself a very complex thing. For it grows, as does the physical body, which, in point of fact, grows only because it keeps pace with the astral pattern, following slavishly all changes occurring therein. All of the five senses are in reality situated in the astral body, and function in the physical only through the appropriate organs. Furthermore, diseases which rack the body and mind originate in the astral body, and this is why it is so dangerous to "dam them back" by the applications of psychological treatment, as in Christian Science, or Psychoanalysis. For the disharmonies brought about in the astral body, resulting from inharmonious thoughts in the mind, must find their outlet through the body, and if they are not led out naturally and as easily as possible, they will accumulate in the astral pattern until the stress becomes so great that they cannot be held back any longer, and the man will suffer a hundredfold. This is only natural, because it conforms to the law of human affairs here on Earth. The Astral Light, which is the source of the materials of which the astral body is formed, is the great storehouse of men's thoughts and passions, and wars do not commence on the battlefield. They originate in men's thoughts, and every thought of selfishness and avarice and hatred adds to the stress and strain, until finally the forces break through, and war results. The only way to cure these things is to reconstruct the thought-life of humanity by right education. As a man thinketh so is he. The physical body is built around the model or pattern body, and is sustained as long as life lasts, or as long as there is vitality. This establishes another factor in the makeup of man, for these three, Vitality, the Astral Pattern, and the Physical Body, are intimately corporealized, building what Paul the Initiate called Body, when he divided man's nature into three — Body, Soul, and Spirit. Now, this triune entity, the vital-astral-physical portion of the man, is in reality the playground (or it may be, the battlefield) of man's life, and is in itself neither good nor evil, being but an instrument, built by the man for his use while here on Earth. It has the power to act as an entity, being endowed with a life of its own, and knows what it wants. It manifests the will to live, the desire for sensation; and just here, we have a fourth factor, or principle in the constitution of man — Desire. Of course, the word desire is a very general term, and works under many aspects. It can be the almost automatic desire for life, or the instinct of self-preservation, or it can be the more deliberate desire to possess. Again it may take the form of the desire to be, rather than to have, and this may be ambition pure and simple, or it may be the natural expression of the evolutionary urge to grow. Again, desire in its highest form is aspiration, as being a self-conscious and deliberate choice of becoming a servant of the higher Law for the benefit of humanity. But however it may appear, it stands behind the will to live, and is the motivating power not in man alone, but throughout Nature. But Desire cannot function at its best unless it is guided by the Mind, a fifth factor in the constitution of man and that which places him evolutionarily above the beasts. It is in the mind that arises the feeling of "I am I." But the mind is not to be thought of as the apex of man's development, for intellect is not necessarily intelligence. Intellect is a technique of the mind, whereas intelligence is a quality of the Spirit. Without the warming influence of spiritual intelligence, a man may be a brute, a cold, heartless intellect ruling a clever personality and body, a menace to society. The heartlight of the spirit is a direct emanation of the Divine within man, his Inner God. As it helps sometimes to bring home more forcibly to our minds the import of these teachings if they are placed before us in diagrammatical form, we shall now tabulate them as far as they have been enumerated, but shall do so with the warning that a tabulation or a diagram is not a picture of a thing, but merely the setting forth, in a clearer way perhaps, of the principles involved in the life of a man, or whatever else we may be studying at the time. It may be well to point out that it is the union of the mind with the spiritual intelligence which forms what in Theosophical parlance is called the Higher Self, the seat of all the finer qualities of the man, and the source of true understanding, for all knowledge is locked up within the heart of man, and education in spiritual matters is merely a bringing to the mind the things that are really his, and the process of learning is in reality a process of recognition. The Higher Self is the Teacher within, and is the Highest Teacher a man can have. All true teachers point the way toward a recognition of the Teacher within, for having once found him, an "outer" teacher is no longer necessary. The Higher Self becomes a reality to us when we realize that we can become one with its consciousness which is compassion, pure selfless joy, spiritual understanding, and utter peace. The Lower Self, on the contrary, is the union between the mind and the Desire principle, and is the source of disharmony, because its life is essentially selfish, and it is a natural law that to work for self is to court disappointment. The mind, which is the focus of consciousness of the man is torn between these opposing forces, drawn upward into the realms of spiritual feeling at times, and pulled down again into the irritating atmosphere of selfishness. And this is no metaphor — it is actual Theosophical Teaching as it has been given us by our Teachers. And it is just here that we have the basis for ethics. When we are taught that if we wish the highest experiences possible for us to have in Death, we must live rightly, it is simply because we have to ally ourselves with one or the other of the forces above and below us. If we ally ourselves with the Spirit within, we naturally rise with it to its own wonderful home to which it returns after the death of the body; and there is no effort to do so, because our nature is akin to its own, we are a part of it. If, on the other hand, we choose to ally ourselves with the personal, selfish side of our natures, we breathe the heavy atmosphere of the Lower Self which cannot arise to those supernal heights to which the Soul belongs, and so we are held back in the dross and slime of the astral world until we are able after much labor to free ourselves, and this is always a painful process. What it all amounts to is that we can do most of our dying here on Earth, and leap forward and upward when released from the body. This, however, is the reward of a life well lived; a life of devotion to a noble work, a life spent in service to others. It is our intention to be a little more explicit as to the actual processes involved in the passage in and out of earth-life, and in doing so we must point out that death is essentially returning everything we have to Nature, and Life on Earth is essentially borrowing from Nature the materials we need for the building of the very complex vehicles that go to make up our bodies and personalities. What is the real man? He cannot be at once the thing that he is and the thing that he possesses. He possesses and uses his body, his mind; he speaks even of his spirit, as though implying possession, and his Divinity, as though he manifests through even that. He is, after all, a spark of That, the Boundless, higher in essence than all of the component parts of his constitution, not even excepting his Divinity. The real man, the spark of consciousness, functions through the human constitution as a whole, and any one of the seven principles in particular. At the present time it is natural for the stream of consciousness to flow through the mind-portion of the constitution with greater force than through any other principle, and evolution will in time work a change in him so that he will naturally focus his energies in and through the Spiritual portion of his being, and finally through the Divinity. This spark of That is deathless, and never loses contact with the Boundless, but it comes and goes, gathering materials on its way to the Earth from the planes of consciousness of which the universe is composed, and on the return journey to the Heart of things, it returns to Nature the materials which it had formerly gathered together for the purposes of manifested life. Each one of our principles has a cosmic source. This is easy to understand in the case of the body which we know is built of the materials of the earth, the food we eat, the air we breathe, and so on. The mind of man is derived from the Cosmic Mind, the Spirit of man is one with the higher realms where the gods abide, and the Divinity within man sprung from Cosmic Deity. Let us think then of the Spark of the Boundless which is to manifest as a man, as acting like a lens with which we can focus the rays of the sun, forming a true image of the sun, and which is composed of sunlight throughout. The rays of light are in no wise different from the light coming from the sun, for it is the same light, bent so as to form an image. And just as the light from the sun is sevenfold, consisting as it does of the seven colors, so is the light forming the image sevenfold, and may be broken into the seven spectral colors. 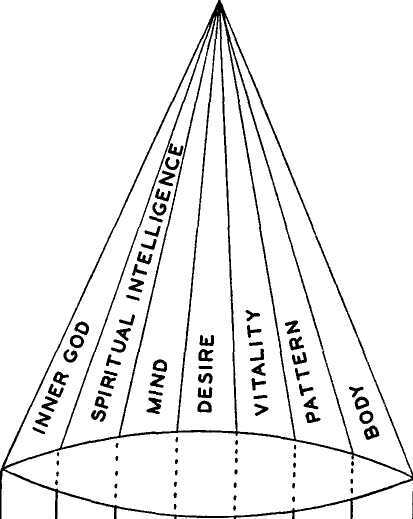 The following diagram will help us to realize that every one of the seven principles of Man has a Cosmic origin. The earth is the cosmic origin of the body, the astral plane is the cosmic origin of the astral pattern. And the human vitality is simply a part of Cosmic Electricity, which manifests in so many ways. Some of the manifestations of Cosmic Electricity are: life, light, gravitation, electricity, magnetism, all instances of this one force acting on various planes. Then Desire is awakened in us, because everywhere there is the cosmic urge to become. It is this urge which brought the worlds into being, so that they, like man himself, are streams of cosmic energy flowing into this plane from other, invisible planes of life. The mind of man then came from Cosmic Mind, or rather, we should say, the mind stuff in which we clothe our ideas, sending them forth as thoughts, is the same as that of which the Cosmic Mind is composed. Then the spiritual intelligence is in reality an embryo god, and its natural home is the god-world, toward which it journeys during the after-death state, carrying us with it, if we are of the stuff that can rise with it to those supernal realms. And lastly, the Divinity within man is a spark of the Cosmic Deity — in no sense of the word "God" as a personalized entity, but the exhaustless fountain of all that is: but one remove from That. We may see in our diagram that imbodied life is like the light passing through the lens, and that man is therefore but a focused image of the universe. His principles bear somewhat the same relation to the Cosmic planes, from which they were derived, that lights bear to Light, beings to Being, sounds to Sound, thoughts to Thought, and so on. None of them could exist for a moment without their cosmic counterparts, for on them they rely for sustenance and maintenance. So Death is somewhat like passing back through the lens, each of the principles becoming one with its source. And rebirth is a new focusing of the image. How fortunate for us if we can so ally ourselves with the spiritual and the Divine within ourselves that we can enter the unutterable glory which companionship with the Gods alone can bring. And it depends upon ourselves entirely. We make of ourselves exactly what we are. We are just where we belong. There is no such thing as being out of place in the universe, for wherever we are, we belong; we have placed ourselves there; and the secret of mounting the ladder of Cosmic Being is to mount the ladder within, whose rungs are the human principles herein dealt with. When we learn how consciously to focus all our energies in the God Within, then it is easy to learn to know the inner worlds, because the Inner God has its natural home in those inner worlds, and it is merely a matter of "going home" whenever the call comes to do so. That is why Theosophy is so practical. Is it not worth a little study?